My husband and I are very particular about where we go out to eat. Most of the time, we choose Mexican food because it is something everyone in my family agrees upon and because we have so many different options of places to eat where we live and each offers a wide variety of truly good Mexican food. When the idea of going out for Italian comes up, I usually opt for making in at home. Not because we don’t love Italian food, because we whole heartedly do, but rather because it is SO much cheaper to make at home… and the only Italian restaurant we really have where I live is Olive Garden. Not saying it isn’t delicious, but we tend to prefer homemade most days. 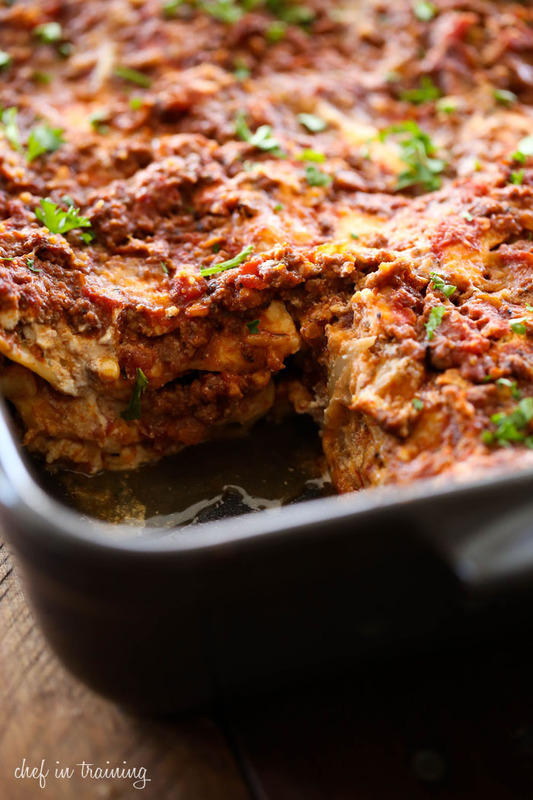 Today, I am sharing the absolute BEST lasagna recipe with you. Honestly, I have tried so many recipes out there, but my mom’s tried and true recipe always wins in the battle, hands down! Its meaty. Its Cheesy. Its divine! It uses three cheeses; mozzarella, ricotta and Parmesan. It also has one of the most flavorful, simple and down right tasty meat sauces you will ever find for a pasta dish. 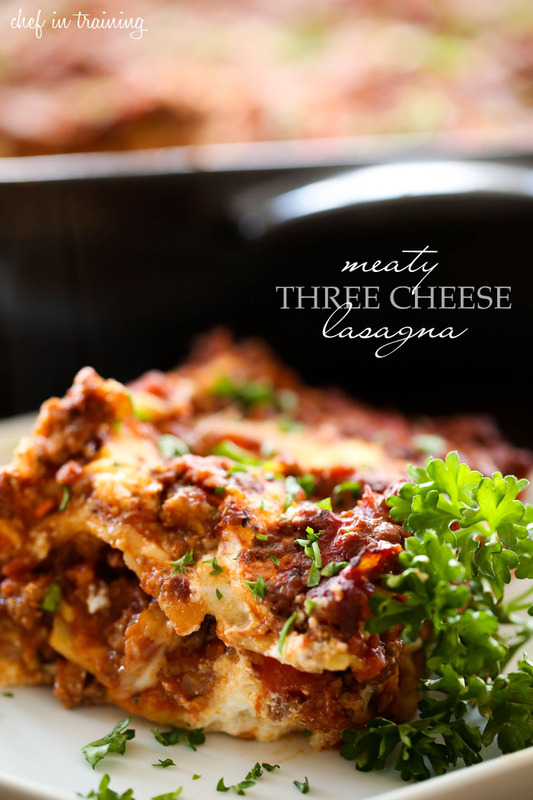 This is honestly THE BEST lasagna I have ever tried! The flavors are incredible! Heat olive oil in a medium sauce pan over medium high heat. Add ground beef, onion and garlic and cook until meat browned and cooked through completely. Add tomato paste, petite tomatoes, oregano, basil, red pepper flakes, pepper and salt. Cook on medium heat until mixture comes to a boil. Reduce heat and and simmer for 3 minutes. Remove from heat. To arrange lasagna, spray a 9x13 inch baking dish with cooking spray and place three noodles on the bottom. Top the noodles with mozzarella, then place small spoonfuls of ricotta over the top of the mozzarella. Top with ⅓ of the meat sauce. Sprinkle with Parmesan cheese. Repeat layers two more times. As a lover of pasta I must say, this looks absolutely fabulous! Mouthwatering even. Pinning! This looks kind of perfect! I love lasagna. Your images look so mouth watering I'm getting hungry just looking at the picture and reading the recipe. Hi Nikki, I tried out this recipe last night and it turned out great!!! Thanks so much for sharing and been a single mom, I am always looking for simple recipes to prepare for my little girl. The only question I have is do you use the noodles straight from the package or cook them to a certain degree before assembling the dish? Thank you and I look forward to trying this recipe! Do i have to pre cook the lasga sheets? Never made this before. Do you cover while baking? I have made this several times now and it is a favorite of anyone who eats it. I add just a smidgen more cheese than yours calls for - it seems to hold it together a little more and a bit more garlic (my husband loves it, that's why! ), but this is the best lasagna I've ever had. I cannot go back to store-bought or restaurant lasagna; it takes so bland now! Thank your for sharing!